Five young boys of Chandio community namely Ayaz s/o Saleem Chandio, Shakeel Ahmed s/o Mohummad Malook, Fayaz Ali s/o Sabu alias Sabir Chandio, Mushtaq s/o Allah Ditto, Akram s/o Pyaro Chandio have been booked under blasphemy law on complaint filed by a member of religious organization on 23 January 2013 for an incident happened on the same date. FIR was lodged at Bhitai Nagar police station which has arrested three accused and is raiding homes of the rest. According to complainant, above named accused were burning the effigy of Hazrat Umer Farooq (R.A) on 23 January, 2013 at 3:15 at Chandio Village Qasimabad, near Happy Homes. Families of the accused told the RightsNow Pakistan that this is a fake and fabricated story designed by the complainant who has animosity with the accused. Families of the accused have made appeal to the Chief Justice of Pakistan for giving them justice. They have also contacted the local police chief for fair and impartial inquiry of the matter and justice to their children. RightsNow Pakistan is closely monitoring and tracking developments in the case and has called for an independent and impartial inquiry of the case by an honest police officer. RightsNow Pakistan has also flagged a concern that there are precedents when this law was misused by some actors against other people particularly religious minorities to settle their scores. Therefore, there is need of fair and impartial inquiry. Section 295 of Pakistan Criminal Code forbids damaging or defiling a place of workshop or a sacred object. Section 295-A forbids outraging religious feelings. Section 295- B forbids defiling the Quran. Section 295-C forbids defaming the Islamic Prophet Mohummad (Peace Be Upon Him). Except for § 295-C, the provisions of § 295 require that an offence be a consequence of the accused’s intent. Defiling the Quran merits imprisonment for life. Defaming Muhammad merits death with or without a fine. (See below Sharia.) If a charge is laid under § 295-C, the trial must take place in a Court of Session with a Muslim judge presiding. Section 298-A prohibits the use of any derogatory remark or representation in respect of Muslim holy personages. Section 298-B and Section 298-C prohibit the Ahmadiyya from behaving as Muslims behave, calling themselves Muslims, proselytising, or “in any manner whatsoever” outraging the religious feelings of Muslims. Violation of any part of section 298 makes the violator liable to imprisonment for up to three years and liable also to a fine. Between 1986 and 2007, Pakistani authorities charged 647 people with blasphemy offences. Fifty percent of these were non-Muslims, who represent only 3% of the national population. No judicial execution for blasphemy has ever occurred in Pakistan but 20 of those charged were murdered. By 2010, the total number of people charged under these laws had grown to about 1274. Section 153 A (a) PPC, may be useful in countering misuse of the Blasphemy law. According to it, whoever “by words, either spoken or written, or by signs, or by visible representations or otherwise, promotes or incites, or attempts to promote or incite, on grounds of religion, race, place of birth, residence, language, caste or community or any other ground whatsoever, disharmony or feelings of enmity, hatred or ill-will between different religious, racial, language or regional groups or castes or communities” shall be fined and punished with imprisonment for a term that may extend to five years. By its Constitution, Islam is the state religion. By the constitution’s Article 31, it is the country’s duty to foster the Islamic way of life. The official name of Pakistan is the Islamic Republic of Pakistan whose more than 96% population equal to 167 million (2008) is Muslims. Among countries with a Muslim majority, Pakistan has the strict anti-blasphemy laws. The main purpose of the law is to protect Islamic authority. However, the same constitution in its article 33, recognize the duty of the State to discourage parochial, racial, tribal, sectarian, and provincial prejudices among the citizens. Its article 25 talks about the equality of all citizens before the law and equality of all citizens before the law. What do religious minorities think about this law? Leaders of religious minority groups say this law is being used to persecute people of other religions and religious Muslim minorities like Shi’as. Pakistan’s “Blasphemy Law” has driven the country’s religious minorities – Christians, Hindus and Ahmadis, a dissenting Islamic group – into “a state of fear and terror”, said by World Council of Churches (WCC). Being a Shia, I am vulnerable to fall prey to this law. Because Police investigate accusation under pressure and Judiciary is also feel reluctance to grant bail to those accused of blasphemy. Lawyers also do not want to take risk of their lives and mostly refuse to represent accused in the courts. World Christian Council is of the opinion that this law was vaguely formulated and is being arbitrarily enforced by the police and judiciary in a way which amounts to harassment and persecution. According to them, this law has led to false imprisonment, mob killings and forced conversion to Islam. They pointed the case of fourteen years old, Christian girl, Rimsha Masih, who was accused of committing crime of blasphemy who was later aquited by the Supreme Court, the highest court of country. 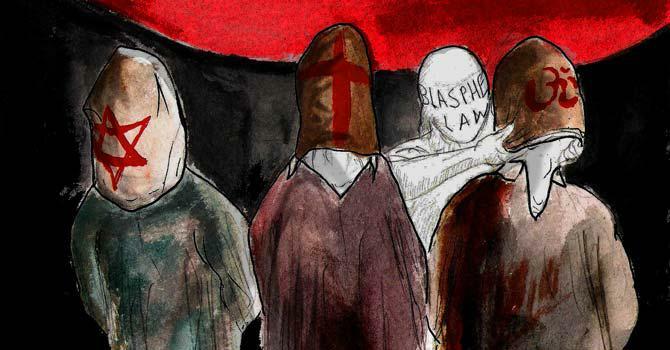 What do moderate Muslims think about blasphemy law? Muslim generally think that such law should be there for baring insults to Islam, prophet, and caliphates but there should be strong check on such laws preventing their misuse. There are evidences when this law was used to settle personal scores and vendetta, said a journalist. When people are accused of blasphemy, they are deprived of all legal, social and community protections. This law has also become a source of harassment by evil actors. No one can speak against the law or repealing it because it is perceived very popular in ordinary Pakistanis. In January 2011, the powerful governor of Punjab, Salman Taseer was killed by his own bodyguard for publicly urging reform of the blasphemy law.